According to recent data, up to 60 percent of users decide to opt-out of push notifications on mobile apps. The real takeaway from this information is that it truly depends on your industry in terms of how many people opt-in or opt-out of the push notifications. For example, ride sharing apps see tons of people who opt-into your push notifications, because, well, it just makes sense. Users need a push notification to let them know when their ride has arrived. The Food and Beverage and Financial Services industries also see higher than average opt-in rates, because the information is typically seen as valuable. Think about how important it is for you to receive a push notification about one of your financial accounts possibly being hacked into. In this case you need to Opt-Into Your Push Notifications in advance. It’s also nice when you receive a notification when the local hotdog stand down the street is holding a sale during the lunch hour. The point is, it really matters what industry your app is in and what type of content you send out. If you are noticing that not many people opt-in to your push notifications or you are worried that your future app will see the same fate, it’s time to do something now. After all, push notifications are a strong way to keep people coming back to your mobile app. Let’s take a look at how to get people to opt-in to your push notifications. When users opt-into your push notifications for ride sharing they know that it’s because they want to see when a ride shows up or a deal is posted. Let’s say for example you run a travel company and the industry opt-in rates are around 45 percent. In order to improve this number you need to provide transparent information on what people can expect when they opt into your notifications. Include a splash page that outlines the benefits of the push notifications when people immediately open the app. If you manage a store front, include a sign or simply tell people why the push notifications are the strongest feature in your app. Talk about how the notifications send out deals for travel and messages for when they need to get to their flight. When I was a kid I would always try to wait until my parents were in a good mood to tell them that I received a bad grade on my report card. This same mentality goes for convincing people to opt-into your push notifications. What are the chances of someone doing opt-into your push notifications when they haven’t even seen what the app can do? If the opt-in question comes right before they open the app or when they land on the home screen they probably have no intention of opting in because it’s just another app that wants to send them messages. Allow your users to become more familiar with the app before dropping the question. When they are comfortable and understand that the app adds real benefit to their life they are more likely to click on the Yes button. Keeping around users is all about staying consistent and living up to your promises. If someone sees that your push notifications are used primarily for buy one get one free offers on the weekdays then they might opt-in. If they download the app and start to realize that you use your notifications to simply say that your restaurant is open, you didn’t live up to your promise and people won’t stick around. Keep your notifications relevant and create a schedule so that a notification goes out maybe every week or month. This builds buzz and generates a group of loyal followers who are waiting for that push notification. 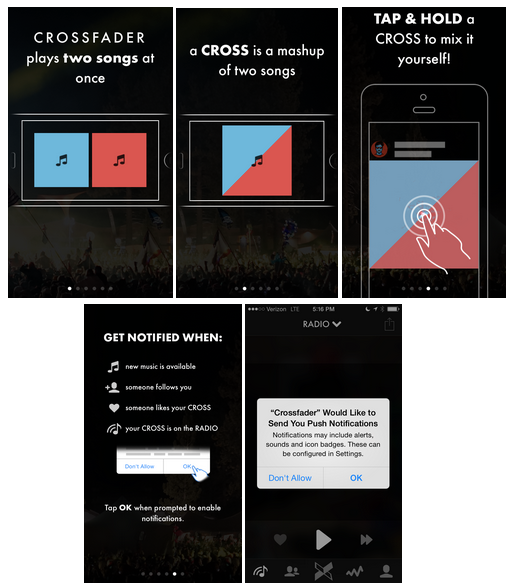 This Andrew Chen article explains how the Crossfader DJ app displays a sleek tutorial for people when they download the app. This ties into my initial point on stating clear benefits for push notifications, but it includes guidance to show immediate value from the app. Let us know in the comments section if you opt-into your push notifications your users and they are received well by users. If you have any questions about how to improve your opt-in rates share them with everyone and we will try to help you out.